When you pick up a book expecting it to be one thing and it then turns out to be something else entirely – it can be a very disconcerting experience. I was well into Chapter Three of Crossed Wires before I realized that, contrary to appearances (for which read ‘seriously pink cover’), it wasn’t a piece of inconsequential romantic fluff at all, but something far deeper and much more subtle. The leading characters – Peter and Mina – with their respective coteries of friends, neighbours and family are revealed so gradually and with so much care that it’s almost exactly like getting to know people in real life. Such painstaking attention to detail and psychological accuracy could have resulted in a worthy and inspiring plod, but Rosy Thornton writes with a light hand, a lighter heart and sure grasp of what makes people tick. Her protagonists are real and recognizable human beings, the sort you meet every day – at work, in the supermarket or in the library – and they behave and react like real and recognizable human beings too. Further, there isn’t a chiseled profile, tip-tilted nose or twinkling eye anywhere in evidence partly because – cunningly – this is a courtship played out over the telephone (a particularly clever twist to an old technique) between two ordinary people muddling through ordinarily messy lives and managing the best they can. When they do finally meet, face to face, the result is … well … let’s say not what you might expect, and certainly not what would happen in your average romantic novel. Like all of us, Peter and Mina occasionally act on impulse, stay silent when they should speak and make assumptions when asking one simple question could save them a whole world of pain. Their conversations sometimes stumble awkwardly and they say daft things without thinking. They try, through it all, to do right by those around them, and they nurse their respective hurts stoically and uncomplainingly. They are, in many ways, Everyman. Creating two fully-rounded lead characters is impressive enough – but here they’re backed up by an equally well-drawn supporting cast. Their children – Kim, Cassie and Sal – are wonderfully well observed; Mina’s good-hearted but breathtakingly blunt mother is a brilliant creation, and the far-from-straightforward gay couple who so often end up as babysitters really deserve a book all of their own. It’s novels like this that make you wish publishers and booksellers weren’t apparently so hell-bent on putting books in pigeonholes, because Crossed Wires is about as far removed from bog-standard romantic fiction as Edith Wharton is from Barbara Cartland. If all of that makes it sounds incredibly heavyweight and intellectual and scary, it’s not. Crossed Wires is, simply, a beautifully told love story – a modern fairy tale even – but one with a heart, a brain and both feet planted very firmly on the ground. Headline Publishing. 2008. ISBN: 978-0-7553-4554-0. 309pp. You’re the second person tonight to say that a book cover was misleading–I wonder what’s to do about that? I’d rather know what I’m getting into, although I suppose some books defy categorization. A wonderful review! Well done, Rosy, and definitely one for my list! 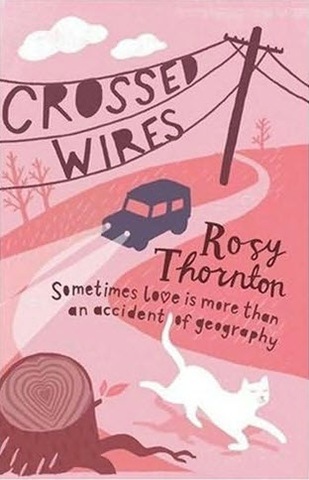 I can’t improve on this review, which unerringly captures all that is satisfying about Crossed Wires – thank you Moira, and thank you Rosy for a wonderfully subtle love story. I am a fan of the cover – underneath the pinkness of its undeniable pinkness, it is very clever. Great review! I wouldn’t normally pick up something so … well… pink, but everything I’ve heard about Crossed Wires makes it sound lovely. Well done, Rosy! Actually, is pink the new black now?? Great review, Rosy! Can’t wait to read it! Great review, and – yes, I agree, a great book. Especially the characterisations. I love the worlds Rosy creates in her books – they always feel so welcoming and warm somehow. I’ve read other Thornton books & agree with the insight & realism, so I’m looking forward to reading her latest. I really hope that cat on the cover got out of the road in time, it worries me…. I’m looking forward to reading this, pink cover or not. I wonder if publishers realise that covers like this put off as many readers as they attract? This entry was posted on February 13, 2009 by Moira in Entries by Moira, Fiction: general, Fiction: romance, Fiction: women's and tagged Cambridge, Hearts and Minds, More Than Love Letters, Rosy Thornton, Sheffield.